U.S. Secretary of State John Kerry has announced plans for a broad international meeting on Syria during the coming week, stepping up diplomatic efforts to reach a political settlement of the prolonged and bloody conflict there. 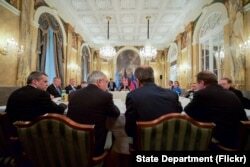 Kerry spoke to reporters here late Friday after meeting with Russian Foreign Minister Sergei Lavrov. Officials said the two senior officials were trying to find common ground between Washington and Moscow in their discussions about Syria's political future. The two also met with the foreign ministers of Turkey and Saudi Arabia in talks that Kerry described as "constructive" and "productive." He said they agreed "to consult with all parties and aim to reconvene," as early as next Friday, in a broader meeting aimed at advancing "the meaningful political process." "This is a multilateral, collegiate effort, and there are no self-appointed leaders. We are just trying to explore ideas," Kerry said, emphasizing that all participants would be equals. "We look forward to expanding to countries that have a great deal of concern about this." European Union High Representative Federica Mogherini, and United Nations Special Coordinator for the Middle East Peace Process Nickolay Mladenov -- for a meeting at the Imperial Hotel in Vienna, Austria, on Oct. 23, 2015. Earlier, during a joint appearance with Jordanian Foreign Minister Nasser Judeh, Lavrov told reporters that Russia and Jordan had agreed to coordinate their military actions in Syria, including air campaigns. The announcements come just ahead of Kerry’s trip to Jordan for consultations with Jordanian officials and also Palestinian leader Mahmoud Abbas. Speaking through a translator, Lavrov said, "We think that other states participating in this anti-terrorism fight can join this effort as well." The Russian foreign minister said the two countries had agreed to cooperate through "working mechanisms" in Jordan. Judeh said there had been ongoing consultations between Russian President Vladimir Putin and King Abdullah of Jordan on the situation in Syria. He said both sides were committed to finding a political solution to end Syria’s "ongoing cycle of violence." Kerry and Lavrov also are meeting with representatives from Turkey and Saudi Arabia. "We believe that the Russian interference in Syria is very dangerous because it exacerbates the conflict," Saudi Foreign Minister Adel al-Jubeir said before Friday's talks. While both Russia and a U.S.-led coalition have a military air presence in Syria, they have differing views on how to resolve the country’s internal turmoil. FILE - The long-running conflict in Syria, and other countries plagued by war and poverty, has fed a massive migration to western Europe. Migrants wait for buses in Nickelsdorf, Austria, after crossing from Hungary, Sept. 21, 2015. Russia has backed Syrian President Bashar al-Assad politically and militarily, while the United States believes Assad should not be part of any long-term political resolution to Syria’s conflict. "The issue is: Can we get to a political process during which time the future devolution and allocation of power in Syria is properly allocated by the people of Syria?" Kerry said during a Thursday appearance with German Foreign Minister Frank-Walter Steinmeier. "That’s what we are working towards." A U.S.-led coalition has been providing military support to the moderate Syrian opposition as part of a wider campaign to fight Islamic State militants in the country. However, Russia has targeted the opposition in airstrikes as part of its efforts to back the Syrian government. On Thursday, Putin accused the United States of playing a "double game" in Syria that involves fighting "terrorists" while trying to use some of them to advance its own interests in the region. U.S. Ambassador to the U.N. Samantha Power said Russian airstrikes are interfering in Syria and making the Islamic State group stronger. She said she hoped the meeting between Kerry and Lavrov "will result in Russia re-committing in words and in action to a political solution for Syria." Kerry traveled to Vienna from Berlin, where he met with Israeli Prime Minister Benjamin Netanyahu, European Union foreign policy chief Federica Mogherini and Germany's Steinmeier. The U.S. has been urging Israel and the Palestinians to tone down their rhetoric in the wake of a series of attacks and shootings that have killed nearly 60 people, mostly Palestinians. After a four-hour session Thursday with Netanyahu, Kerry said he had a "cautious measure of optimism" that a solution could be found to defuse tensions. He said some proposals might be put on the table in the coming days that would help stop the unrest.